The most basic thing you need to meet your artistic requirements is an artist stretcher bar. It will let you stretch the canvas you are working on to meet the artistic needs and explore the artist inside you. 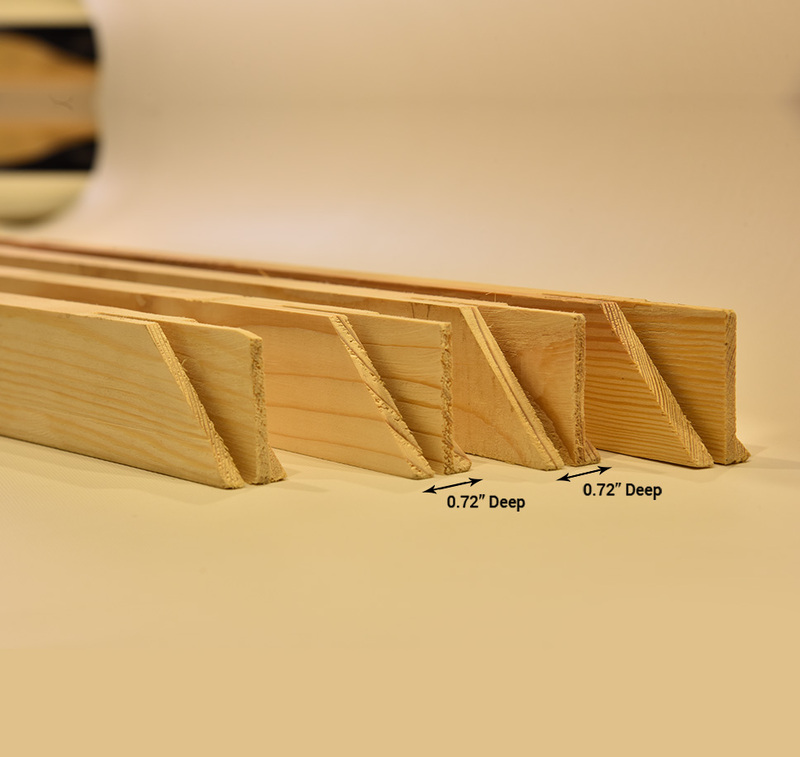 At CanvasChamp we make wooden stretcher bars made with kiln dried pine, strong enough to hold any size of canvas on it. With rounded edges, they are the perfect fit for any canvas. Take personalization to another level, stretch your rolled Canvas big or small on our Stretcher Bars. They are made of Kiln Dried Pine wood which keep it strong and straight. The edges are rounded making it suitable to stretch even a printed canvas. Make your canvas truly personal. Can't find a way to let out your self-expression? Does the artist inside you feel trapped? Do you know what you are missing from your art collection? A stretcher bar! 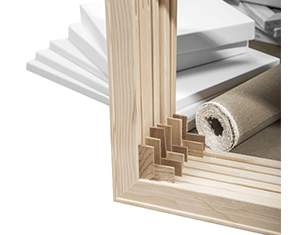 Stretcher bars will let you stretch the canvas to meet your artistic requirements. These bars, made from Kiln Dried Pine, a strong and sturdy wood with rounded edges, will ensure your artistic expression shines through. When you need to add a touch of personalization, there is only one canvas with the ability to make that happen. Stretcher bars can fit any canvas, even a printed canvas. 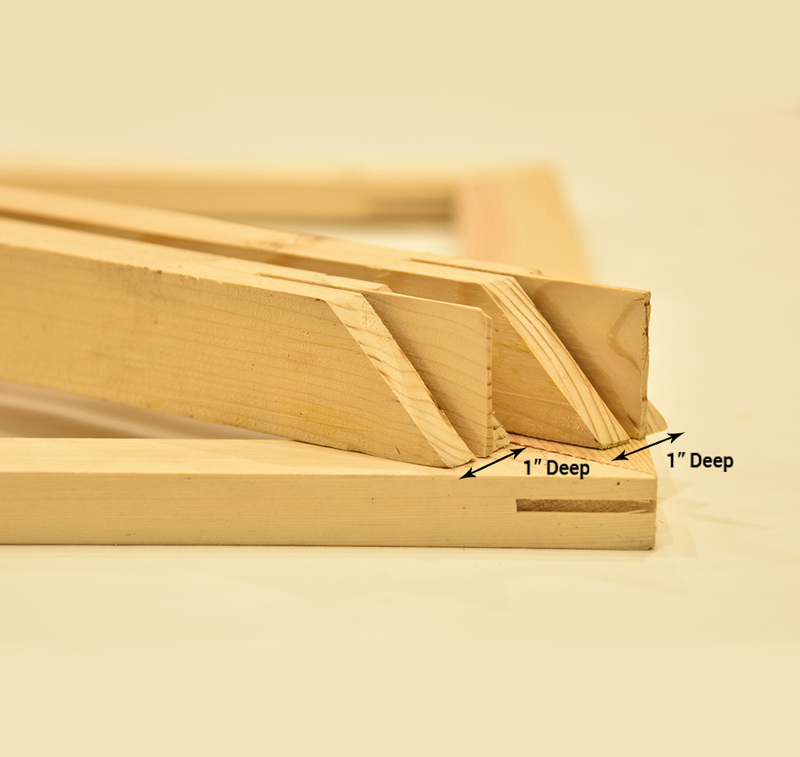 You can purchase smaller or taller stretcher frames depending on the type of canvas you are working on. The dependable stretcher bars constructed using Kiln Dried Pine, and due to the wood's sturdiness, your canvas will stay put. Use the shorter wooden frames for canvas and the taller wooden frames for floater frames and gallery wraps. You have the choice from choosing a wide range of stretcher bars prepared by our expert designers. Your choice of stretcher bar should also depend on its height and riser height. 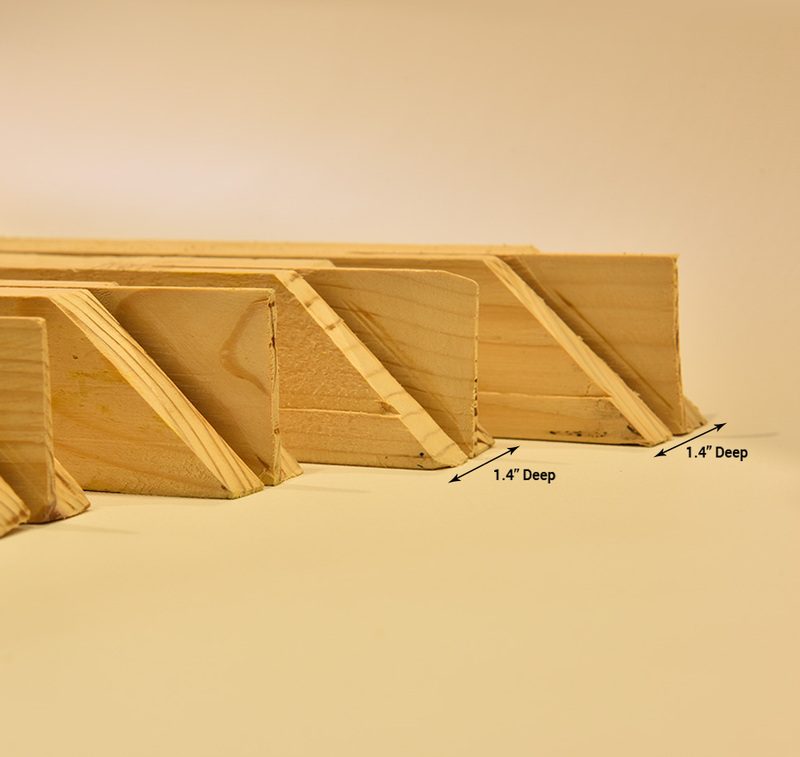 The riser height refers to the difference between the top edge and the wide flat top. Selecting the right height of the riser is essential, as it determines the distance between the canvas and wide top face. Go for a higher riser if the material you are using to create your artwork sags after a while. 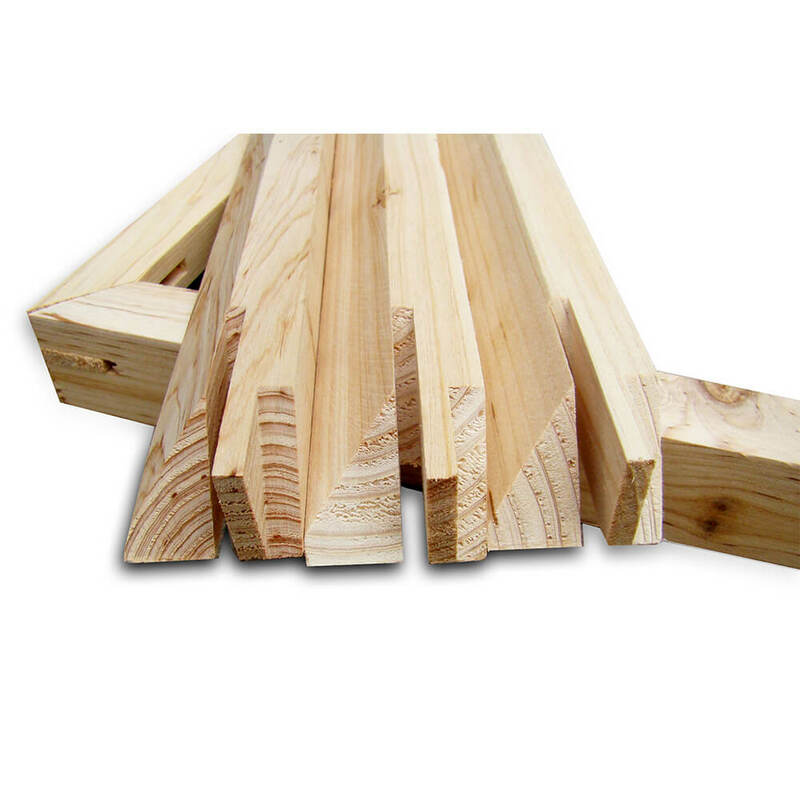 Stretcher Bars are available in 3 variants, Light(0.72"), Medium(1"), Heavy (1.4"). For bigger sizes we suggest going with the thicker bars. All quality backed with 100% satisfaction guarantee as on all products by CanvasChamp. Since an artist wants to display their artwork, they need the most optimal support for their canvas, one that withholds with time, and stretcher bars is what comes to mind. Using Kiln Pine Wood, our designers ensure that they only pick the best and unknotted ones from the stock. The edges of the wood are rounded to provide you with a tighter and smoother frame for the canvas. The roundness of the edges has two other benefits. First, it permits you to see and get clear edges on canvases with exact borders, and second, it enables the canvas to carefully weave over the stretcher bar instead of snapping over a sharp edge, which could result in a damaged canvas. The durability of the stretcher bar is achieved by joining the corners of the frame with v-nails and glue. The stretcher bar is available in sizes, Light(0.72"), Medium(1"), and Heavy (1.4"). The prices of the stretcher bar per strip vary as well depending on its length, ranging from 8 to 50. The variation in length and size will help you fulfill your canvas requirements, as you will able to find the perfect stretcher bar to display your creativity to people. Ask about Stretcher Bars and get answer in email. *What do you want to know about Stretcher Bars?